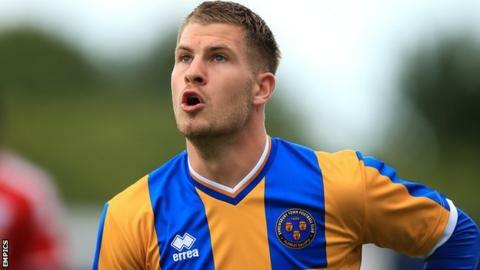 Collins, 25, had started Shrewsbury's last 12 games and frequently skippered the team, scoring seven goals for the League One side this season. "We thought it would be best for all parties to make way and free up some money." Collins captained the Shrews in their 7-1 defeat by Chesterfield on Saturday. "It's never nice to leave a football club that you've been at for a while but to leave off the back of a 7-1 defeat made it even worse," added Collins. "With my experience of getting promoted out of League Two, I was confident I could come down and help Northampton, and get a third promotion out of this division on my CV." Meanwhile, Ryan Watson and Dominic Calvert-Lewin have left Northampton and returned to Leicester City and Sheffield United after their loan spells expired.